CoreLogic says mortgage delinquencies in January were the lowest for that month in 20 years. Meanwhile, in a separate report, they note that non-mortgage consumer debt has been edging up, due in part to a deterioration in lending standards. The company's Loan Performance Insights Report for January puts the national delinquency rate (the percentage of outstanding mortgage loans that were 30 or more days past due including loans in foreclosure) at 4.0 percent, down from 4.9 percent in January 2018. In 2010, at the height of the financial crisis, the January delinquency rate hit a peak of 12.0 percent. This continues a trend that started last March. 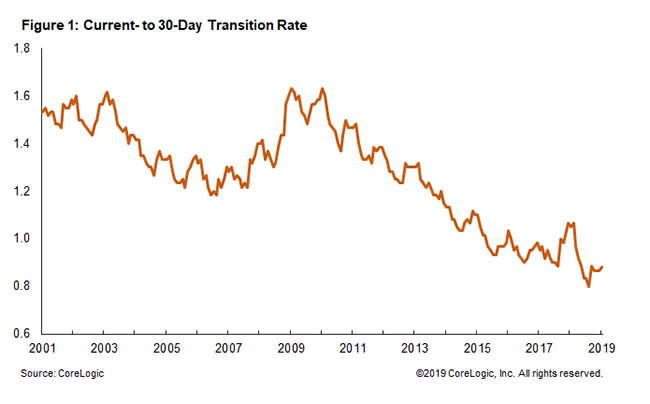 CoreLogic says that since then the monthly delinquency rate has been lower than the corresponding months during 2000 to 2006, before the start of the crisis. The rate for early stage delinquencies, loans 30 to 59 days past due, was down to 1.9 percent compared to 2.0 percent the prior January and loans that were 60 to 89 days overdue had an 0.7 rate, down 10 basis points on an annual basis. Serious delinquencies, defined as loans 90 days or more past due or in foreclosure dropped from 2.1 percent to 1.4 percent year-over-year. This was slightly below the average January rate from 2000-2006 of 1.4 percent. The foreclosure inventory rate was 0.4 percent, also the lowest for the month in at least 20 years and below the pre-crisis average of 0.6 percent. CoreLogic says the level of homeowner equity due to rising home prices is reducing the risk of foreclosure. No state logged an annual gain in its serious delinquency or foreclosure rate; only North Dakota posted a gain in the overall delinquency rate. CoreLogic also tracks the rate at which mortgages transition from one stage of delinquency to the next. In January the transition from current to 30-days past due was 0.8 percent, unchanged from the previous January. The 30-to-60 days rate rose from 14 percent a year ago to 14.9 percent, and the 60-to-90 days rate was 24.9 percent, down from 26.5 percent. In a separate article in the CoreLogic Insights blog, chief economist Frank Nothaft credits underwriting as well as increasing family income and home price growth with the recent record low mortgage delinquency rates and says one might expect that other forms of consumer debt would match the trend. Instead, the 90-day delinquency rate for the four types of consumer credit - auto, credit card, student loans, and "other" debt - has been moving up for two years, rising from a post-recession low of 7.4 percent in the third quarter of 2016 to 8.0 percent in the fourth quarter of 2018 and two 2 points higher than in 2003. During that 12-year period consumer debt doubled, from $2 trillion to $4 trillion and its composition changed. 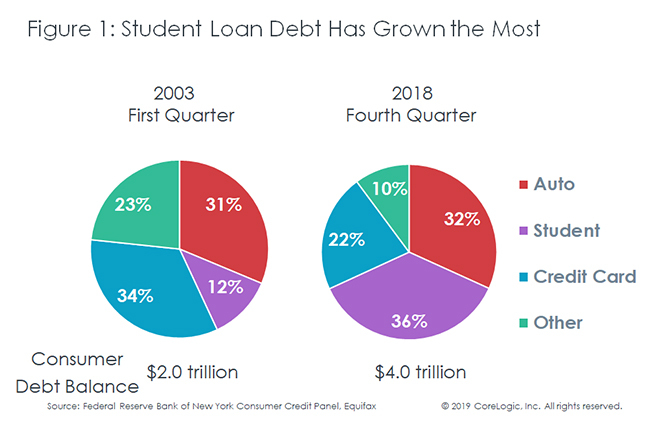 Student loan debt rose from a 12 percent share of non-mortgage consumer debt in 2003 to 36 percent in the fourth quarter of last year, and the dollar amount has risen six-fold to $1.5 trillion. Auto loans are the next largest slice of consumer credit with $1.3 trillion outstanding. These two types of loans represent an aggregate of two thirds of total consumer debt. The delinquency rates of both have been rising and are now above their levels 12 years ago. 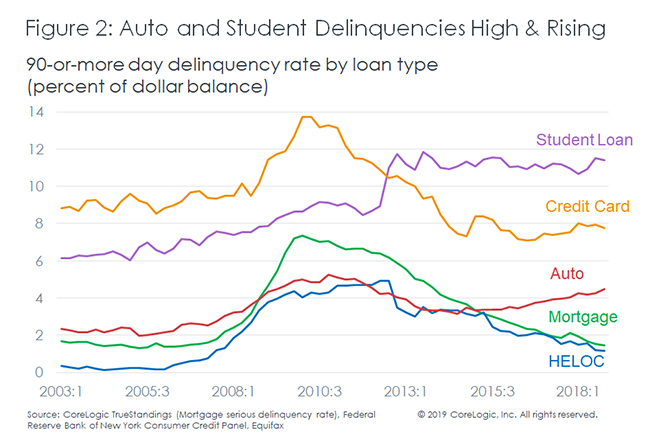 Student loans have had 90-day delinquency rates above 10 percent since 2013. In contrast, credit card delinquency rates are below where they were in the early 2000s, and home mortgage and HELOC delinquencies continue to move lower. Nothaft says one reason for the deterioration in auto loan performance relative to home mortgages has been the extensive volume of subprime financing. Twenty percent of auto loans made last year were to borrowers with credit scores below 620 and nearly one-third were below 660. CoreLogic data shows only 1 percent of home mortgage borrowers had a credit score below 620 and only 8 percent were below 660. Nothaft says these high delinquency rates could slow consumption spending and effect home buying in the coming year. This could pose risks to economic growth, household financial health and lender portfolios.